Israel will hold elections on April 9, 2019. Likud dominates the polls amid a shifting party landscape. 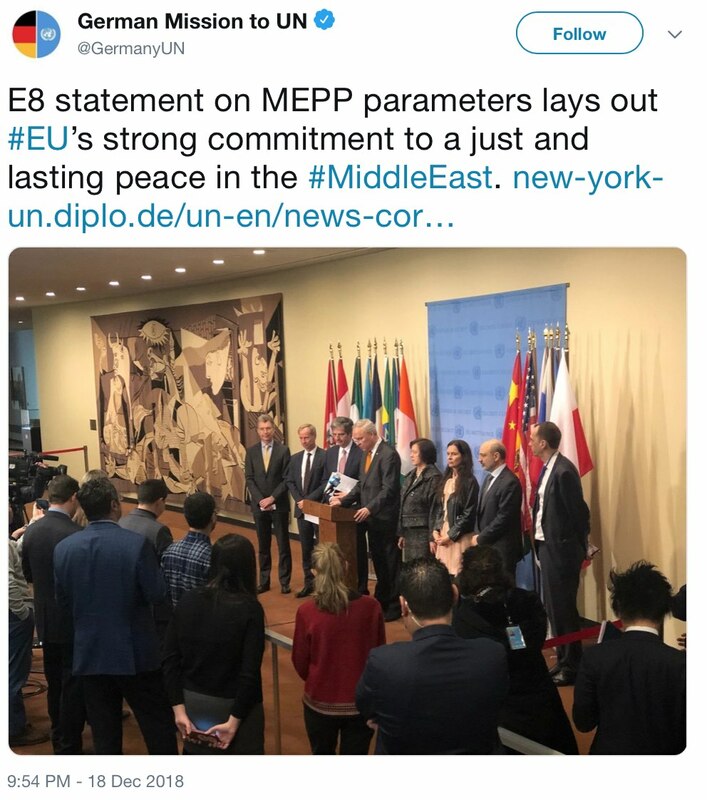 European countries made a stand at the United Nations, sending a clear message in advance of the Trump administration’s peace plan. Earlier this month, the West Bank was a primary scene of escalation, demonstrating the unstable nature of the status quo. Mahmoud Abbas dissolved the Palestinian parliament in a move that has legal, public, and political implications. These events and contradictory trends ultimately moved the Two-State Index (TSI) down by 1.6%. The full report is below, including a TSI review of 2018. 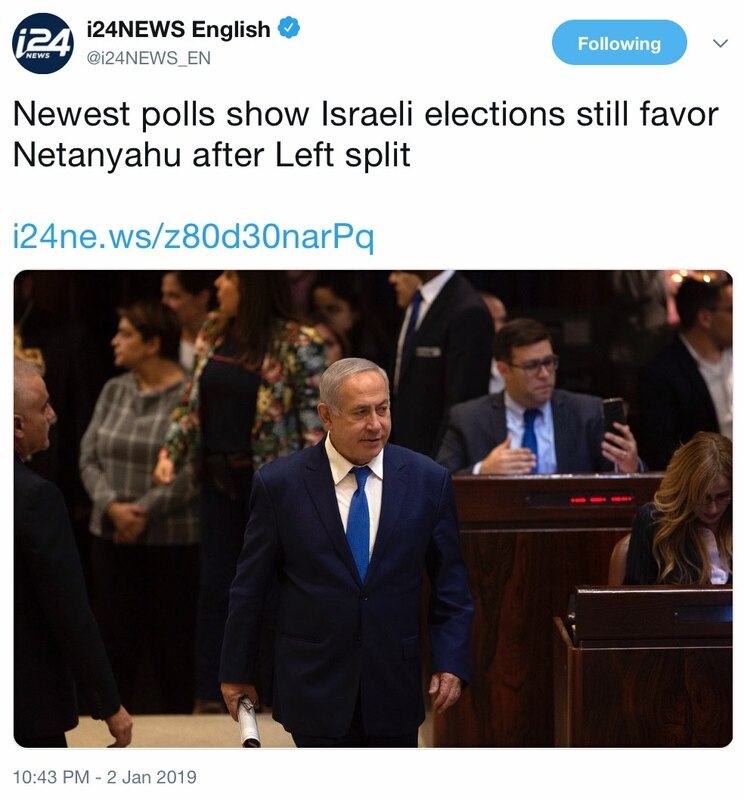 Israel will hold elections on April 9, 2019. After encountering legislative setbacks and facing probable indictments, Prime Minster Netanyahu decided to dissolve the government and call for swift elections. While the election results cannot be foreseen, there is a real possibility of a change in the makeup of the government or in its policy. Even if Netanyahu is elected for another term in office (as opinion polls currently point to), he will likely take into consideration the probability of the unveiling of a Trump administration peace plan later in 2019, after the formation of the new Israeli cabinet. Netanyahu will try to avoid forming a government comprising only two-state opponents that will fall apart after a plan is introduced. Two-state proponents in the political spectrum, as well as newcomer Benny Gantz, the former IDF chief of staff, may well play a more prominent role after elections, even if they do not highlight the Palestinian issue during the campaign. The feeble Israeli-Palestinian process is therefore unofficially frozen until June, and the parameter measuring the Israeli-Palestinian bilateral negotiations therefore moves from 2 to 1. In the interim, events on the ground; developments in the Israeli and Palestinian political arenas; as well as preparations by civil society organizations on both sides, the international community, and cooperation between them — will all help determine the intensity of the peace process once it resumes. For the time being, the parameter measuring the Israeli prime minister moves from 3 to 2; the Israeli government remains at 1; the lame duck Israeli legislature moves from 4 to 2; and Israeli NGOs, who gear up in preparation for the election season, move the Israeli civil society parameter from 5 to 7. Prior to the decision to go for elections, diplomacy took on a leading role at the United Nations, when France, the Netherlands, Poland, Sweden, the United Kingdom, Belgium, Germany, and Italy warned that if the prospective U.S. peace plan disregarded “internationally agreed parameters” — a two-state solution based on the 1967 lines with Jerusalem as the capital of both states — it “would risk being condemned to failure.” The statement followed a U.N. Security Council session featuring an elaborative report by Special Coordinator Mladenov. The warning by prominent European actors demonstrates the international consensus regarding a two-state solution, which is largely consistent with the Geneva Initiative model. It is a notable attempt by Europe to impact the content of the American plan, widely expected to be tailored to Netanyahu’s needs. At the very least, the move demonstrates that the United States cannot take European support for granted, and that the plan’s substance must echo a viable two-state vision. A major component of the European initiative was aimed at creating consensus vis-a-vis the plan. Notably, its signatories include Trump’s ideological allies, such as the ruling parties of the United Kingdom, Poland, and Italy — delivering a blow to Netanyahu and his allies in the Trump administration. This development moves the parameter measuring third-party engagement from 5 to 6, and the one measuring international decisions/resolutions from 6 to 7. Escalation in the West Bank was at play this month. Hamas went on the offensive, launching various attacks throughout the West Bank, and the Israeli government responded by escalating security measures and declaring its intention to accelerate settlement construction. Although the escalation appeared to have been contained, it signaled that the West Bank is not nearly as calm as some in Israel believed it to be. Together with recent developments in the Gaza Strip, the effect on Palestinian public opinion is stark: a significant increase in support for Hamas and for an armed intifada, while support for diplomacy and negotiations decreased. Security coordination between Israel and the Palestinian authority helped contain the violence, but at a cost, as the public overwhelmingly supports stopping security coordination with Israel and reversing its recognition by the PLO. The relative calm at the end of December comes against the backdrop of IDF reports that West Bank attacks have declined for the fourth consecutive year. The Palestinian attacks (West Bank) parameter remains at 5, but moves IDF military actions (West Bank) from 4 to 5. Meanwhile in Gaza, the ceasefire holds, moving the parameter measuring prospects for war (Gaza) from 5 to 6. Notably, reports surfaced that settlement activity spiked since President Donald Trump took office, laying the groundwork for what could become the largest construction binge in years. The TSI follows actual construction starts, while the said construction surge pertains to planning for future construction. We encourage you to follow the additional sources listed below. 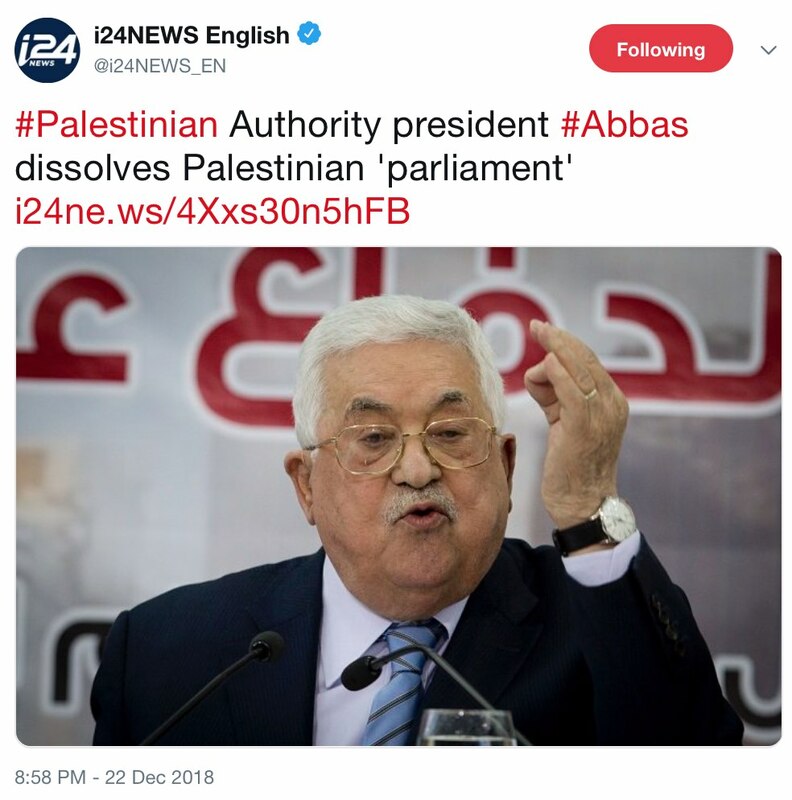 Palestinian President Mahmoud Abbas dissolved the Palestinian parliament, known as the Palestinian Legislative Council (PLC), and called for new parliamentary elections within six months. The PLC was elected in 2006 and expected to serve throughout 2011. It has a majority representation for Hamas and has remained inactive since the internal Palestinian split erupted in 2007. The PLC has been considered a venue for polarization, which fails to serve the interests of voters. Recent Palestinian public opinion polls (December 2018) by the PCRS showed that 47 percent of Palestinians support the dissolution of the PLC while 43 percent oppose it. Nonetheless, 37 percent believe that such a move will harm the prospects of reconciliation, 21 percent believe it will improve the chances for reconciliation, and 34 percent believe it will have no impact on the reconciliation. Given the above, Abbas’s move has both public and legal framing. Technically, it is based on the Constitutional Court’s ruling. Yet, it is still looked upon as a step toward the further distancing of Hamas from Palestinian politics and, in effect, entrenches the split between Fatah and Hamas. In addition to removing Hamas from presidential succession (PLC Speaker Aziz Dweik is second in succession according to the Palestinian Basic Law), Abbas’s move deals yet another blow to reconciliation efforts — all of which relied, to some extent, on setting a date for new elections in view of reactivating the PLC. The parameter of Fatah-Hamas relations moves therefore from 2 to 1. The PLC-focused crisis joins a series of related developments, including ongoing challenges by Hamas to the legitimacy of PLO representation and an ongoing diplomatic offensive by Hamas: its head of politburo, Ismail Heniyeh, is planned to embark in the coming weeks on a visible ten-country tour, including a visit to Moscow. For its part, Russia has played an increasingly visible role in Palestinian affairs. The parameter measuring PLO cohesion moves from 5 to 4. The U.N. General Assembly failed to pass a resolution condemning Hamas; while the US-backed draft resolution got a large majority of votes, it fell short of the two-thirds super-majority needed to pass. The United Nations urged donor states to give $350 million in aid for Palestinians in 2019, down from $539 million in 2018, due to a lack of available donors. Germany designated $62 million toward new Palestinian development projects, of which about $14 million will be set aside for energy projects in the Gaza Strip. The United States and Israel officially quit the United Nations Educational, Scientific and Cultural Organization (UNESCO). Seeds of Peace, who has promoted dialogue between Israeli and Palestinian teenagers for more than 25 years, has cut its longstanding ties with the Israeli Education Ministry in response to a ministry demand for greater involvement in its programs. Israel is nearing completion of a smart sea barrier meant to prevent attacks from Gaza. Australia recognized West Jerusalem as Israel’s capital of Israel, but its embassy would not move from Tel Aviv until a final status agreement. Abbas’s rival Mohammed Dahlan said the two-state solution is not likely to be realized and called for a one-state/equal rights solution. Airbnb suspended the implementation of its prior decision to remove listings in Jewish settlements in the West Bank. 2018 was not a good year for the two-state solution. However, despite the major threats it faced, it remained the preferred option for both Israelis and Palestinians, and even the dramatic political changes that swept the diplomatic framework — specifically, America’s policies — were unable to undermine fundamentally both the rationale and viability of a two-state solution. As 2018 draws to a close, the TSI stands at 5.24, representing a small uptick of 0.57 percent. This relatively small overall change is partly a result of contradictory trends — as the United States attacks basic elements of a two-state solution, Europe takes a stand. It is also a reflection of a stagnant scene: a bilateral Israeli-Palestinian process is nonexistent; third-party mediation focuses on mitigating violence and consolidating small, marginal economic and humanitarian gains; with each round of talks, Palestinian reconciliation takes one step forward and three steps back; Gaza is at a seemingly never-ending cycle of economic crisis, cross-border clashes, and ceasefire; settlement construction continues unimpeded; and the only ones that take note of core issues — borders, Jerusalem, refugees, and security — are those in Israel or the United States who try to undermine the two-state option. Solvability of the Core Issues: (April 2018 score: 6.49; December 2018 score: 6.38) This arena measures the ability to solve the contentious core issues in a way that satisfies the basic interests of the sides, and it saw the smallest change. These categories give the two-state solution, and with it the TSI, resiliency (and what mitigates dramatic changes elsewhere). Since we estimate that solutions exist for the core issues, this was the arena with the highest score; the only downtick occurred in August when the United States systematically targeted Palestinian refugees by defunding UNRWA and challenging their definition as refugees under international norms. 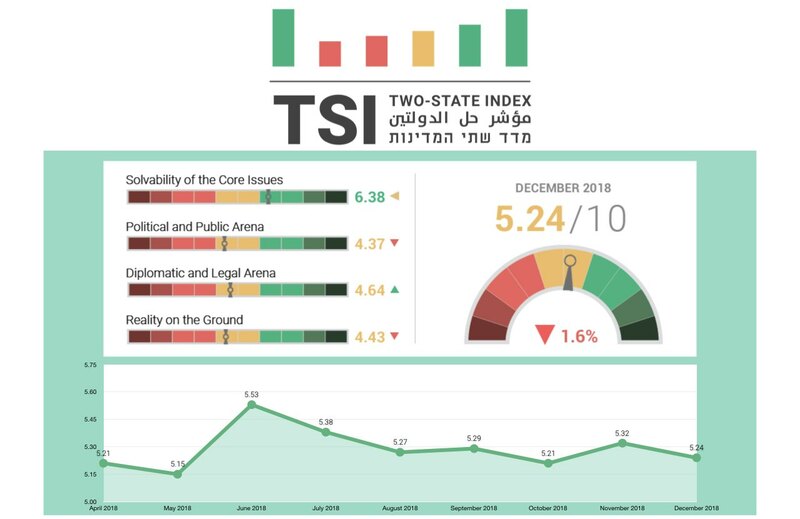 Reality on the Ground: (April 2018 score: 4.42; December 2018 score: 4.43) This arena focuses on the security situation, the settlement enterprise, the effort to build Palestinian capacities, and the contentious dynamics in the West Bank, East Jerusalem, and the Gaza Strip. In 2018 Israel and Hamas came close to war, but with the outside help extended by Egypt, the United Nations, and Qatar, an all-out war did not break out. Still, the reality on the ground arena was relatively stable with the lowest ultimate score of all others. Diplomatic and Legal Arena: (April 2018 score: 4.06; December 2018 score: 4.64) This arena focuses on the diplomatic and legal framework in which the pursuit for two states takes place. In 2018 the United Nations — spearheaded by Special Envoy Mladinov — took on a more prominent mediation role, especially around the question of Gaza. Unfortunately, the complex situation there limited the effectiveness of such mediation to consolidating fragile ceasefires and did not build momentum toward a more comprehensive agenda. Political and Public Arena: (April 2018 score: 4.41; December 2018 score: 4.37) This arena evaluates relevant social, political, and attitudinal trends among Israelis, Palestinians, and international actors. It was the most dynamic arena of all, with the prospects of a U.S. peace plan slowly giving way to the realization that this historically critical player broke away from its traditional mediation role toward an overt pro-Israel, anti-Palestinian posture. The loss of the U.S. voice on the peace process was mitigated only by Europe finding its own. European states confronted Israel (Khan al-Ahmar) and the United States in the United Nations in an attempt to keep the viability of the two-state solution. We encourage you to follow us as 2019 unfolds. Alongside Israeli elections, a U.S. peace plan, and other unforeseen developments, we will be introducing some new features to our Index.